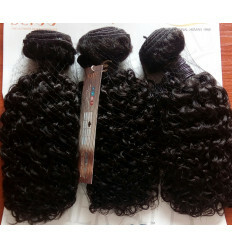 Buy top quality Cheap Human Hair in Nigeria from Nigeria's 1st and Largest Online Human Hair Store. If you need Affordable or Cheap Human Hair in Lagos or anywhere in Nigeria or abroad, we got you covered. Cheap Human Hairs or Affordable Human Hair are Remy or Packet Human Hairs and are Human Hairs that give you the gorgeous look you desire without putting a hole in your pocket. They are Human Hairs but are not 100% Human Hairs like the Virgin Hairs. Our Affordable Human Hairs contains a larger amount of Human Hairs and as such are not synthetic or fibre Hairs. Some have almost the same texture, feel and shine like virgin Hair. They are durable weavon. In fact, some have the same quality and last up to 2 years or more like virgin Human Hair. Human Hair Nigeria does not remove Affordable Remy Hair from their Packs and sell as Virgin Hairs just like most other Sellers do. Any hair in this category will be delivered to you in pack just as it came from the Manufacturer. So all hairs here come in pack.